Absolutely love this, it is beautiful, this is a gorgeous pillow, striking and fun to use! 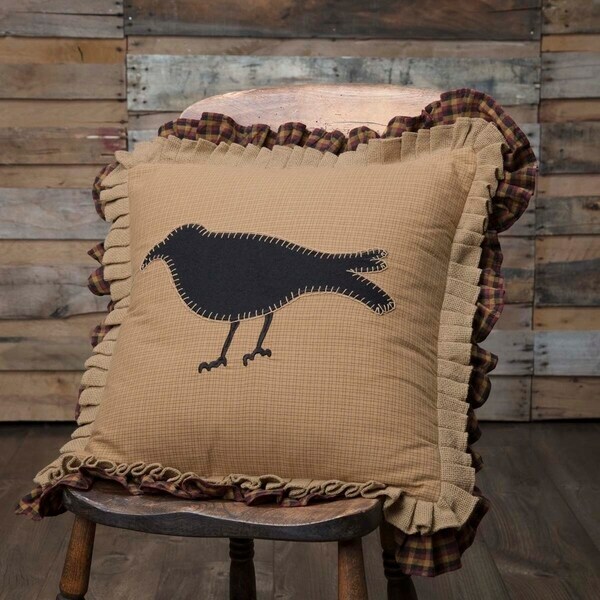 Bring a taste of primitive anywhere in the home with the generously 18x18 sized Primitive Crow Pillow. The crow in the center is appliqued in black felt with tan whip stitching on a mustard plaid base. A double ruffle in natural burlap and burgundy, tan, and black is the finishing touch. Reverses to burgundy, tan, and black check with 2 tie closures. LOVE this crow pillow! It’s a really good size pillow which will make it great for the living room. It’s made well and the colors are excellent. Perfect for my primitive decorating style. I love the VHC brand, it is one of my favorites for bedding, bath, dining, and kitchen. I have several quilts, bed-skirts, pillows, curtains, rugs, napkins etc. These are perfect if you like the Farmhouse theme. They are good quality not to mention the prices are great considering they are hand stitched and machine sewn. I received in 5 days time. Overstock is always great to work with. this pillow works great with my Hazelwood Quilt set. I love it! I bought this throw pillow to go with the folks why quilt set I bought..... It’s really cute with the crow on it and is a nice size! It’s a good quality and size pillow - and our family name means ‘black crow’! Heritage Farms Crow Oval Jute Rug - 1'8" x 2'6"